We’ve been reporting on the general market cooling, if not slowing, in San Diego County for almost a year now. First there were signs of prices flattening, while inventory continued to drop – a strange market dynamic. 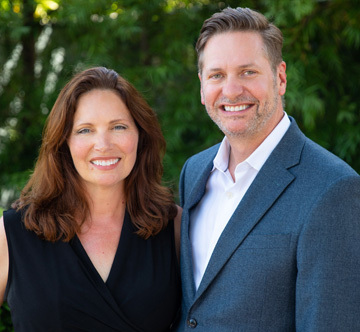 Then, we saw homes taking longer to sell and inventory creeping up, signs that a buyer’s market – or at least a balanced market – might be coming to San Diego after 6.5 solid years of a seller’s market. Now, with one full month of market activity closed out for 2019, we are starting to see a continued downward trend. Nothing startling or anything to worry about – but clearly an unmistakable slowing of buyer activity. NOTE: In our opinion, all markets are buyer’s markets. How can that be? Because nothing happens unless and until buyers decide to do something. Sellers can list a home, but if a buyer does not buy it, nothing happens. If multiple buyers are engaged and making offers on various properties, that means the market is hot. So remember, all market activity is tied to what buyers decide to do – they’re either buying or not buying, and right now, buyers are not buying so much. Which makes our point this month. There is always a seasonal slowdown at the end of the year; holidays, cooler weather, fewer homes on the market, etc. But compared to last January (2018), January 2019’s numbers reveal that buyers are still waiting it out. 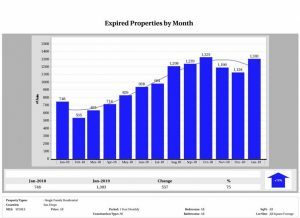 The chart above displays the number of Expired Listings in San Diego County for single family homes during the last 13 months. You can see that there was a 75% increase in expireds when comparing January 2018 and January 2019. The number of sales (homes that were for sale and closed) was down 15%, and prices were up only 3%. Check out this month’s full report for San Diego’s Housing Market for January 2018-January 2019. From everything we are seeing out in the field, our experiences with our home buyers and sellers, and from what we are reading, watching and hearing, we expect this general slowdown to continue in 2019. We don’t expect the metrics to go down dramatically, but the market is adjusting and balancing itself in San Diego because home prices got too far ahead of average salaries. When supply and demand are back in harmony, and incomes can support home prices without having to sacrifice too much of the household budget, the market will rebound from it’s doldrums and return to a warmer or hotter market.